With the rise of digital media and instant access to information and the decline of intermediary agencies relied upon for our information, the media and entertainment is a changing landscape. The fashion industry is going through a really dramatic overturn lately, in a good way. It seems the new trend in fashion is making a difference, not just making great clothes. So now that the grand slam of Fashion Weeks are over for the Fall season (New York, London, Milan and Paris) the real work can begin, because these events brought some important issues to light including racism on the runway, plus size fashion in the mainstream fashion world, and the lack of diversity reflected in fashion in general. Thank goodness there are the brave few who dare to stand out and think more highly of making a valuable statement, rather than just raking in the dollars and cents. Post Paris Fashion Week, a group called Fashion 4 Development met with the who’s who of fashion to discuss ways of making this industry a more meaningful and important experience all round. F4D’s mission is to “harness the power of the fashion and beauty industries and implement creative strategies for sustainable economic growth, wellness and independence of communities worldwide and the preservation of culture through the expression of fashion,” according to their website. Women everywhere almost count fashion as a religion, so the attendees at the 3rd annual First Ladies Luncheon put on by F4D wanted to come up with ways that fashion can engage young women to be agents of social change. The group included Franca Sozzani the Editor-in-Chief of Vogue Italia, Crown Princess Mette-Marit of Norway, Toyin Saraki Founder of the Wellbeing Foundation and Coumba Touré President of the Advanced Development for Africa Foundation. Imagine a world where every garment-lover used their passion as a way to make a difference as opposed to just boosting their own ego and self-esteem? “Fashion encompasses so many industries, from agriculture to communications. The impact is enormous,” said Livia Firth, wife of actor Colin Firth and founder of Eco-Age and the Green Carpet Challenge who was also in attendance at the event. Another issue that has been largely overlooked by the fashion industry but reported on in other sectors is factory workers. 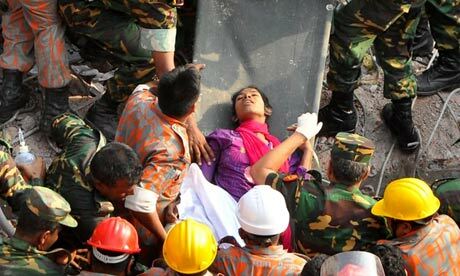 On April 24, 2013 over 1100 mostly female workers were killed when a garment factory collapsed in Bangladesh. The Rana Plaza factory was built on swampy ground and had very unsteady infrastructure. An investigating committee recommended life sentences for the factory owners. It’s a shocking reminder that there has to be full accountability and transparency when it comes to all lines of business in fashion, right down to the the factories that manufacture the garments. Fashion 4 development, created by Evie Evangelou in 2011 hopes to bring more of these issues to light and make everyone from the fashion elite, creative directors, designers, right down to the consumers aware of what goes on away from the glitz and glamor. We love seeing a more in-depth side to a very influential industry that can engage young minds to think outside the box. If you are a lover of fashion or work in this area, what are your thoughts? Do you think about fashion as a sustainable future and an industry that can implement and influence change? Or is it just a way to make money and/or make you look good?